A screenshot from a film documenting the March 4, 1973, release of Navy Lt. Robert Wideman and other American prisoners of the Vietnam War. Robert Wideman adjusts his glasses and runs his hand through his gray hair. He's sitting at his desk in his Fort Collins home looking at a grainy, sound-less film. "I've never seen this," Wideman said. "Never." It's from March 4, 1973. That's the day that Wideman and dozens of other prisoners of war were released in Hanoi, North Vietnam. KUNC found the rare historical footage in reporting this story. In the film, under the watch of their captors, the Americans, one by one, approach a friendly U.S. officer, salute him, shake his hand and get a pat on the back. Wideman, a 29-year-old Navy lieutenant, steps up. Robert Wideman tells the story of his years as a POW during the Vietnam War. "At that point, I'm waiting to get on the plane and waiting for the wheels to come up because they could have called that off at any time," he said. The rare film could have been lost forever if the Maine Military Museum and Learning Center had not rescued it and placed it online. It captures the repatriation of American prisoners of war held by the North Vietnamese government. Six-hundred-and-sixty-two were returned, according to the nonprofit NAM-POWs, a membership group for the prisoners that analyzes Defense Department data. This year, the 45th anniversary of that repatriation, NAM-POWs estimates, loosely, that just 451 of those prisoners are still alive. "There's a lot of guys, especially Army guys, who just blended into society and have disappeared and we can't find them," said NAM-POWs historian Mike McGrath. "We call those guys 'lost sheep.'" McGrath, a former Navy pilot and Vietnam war prisoner who lives in Monument, Colorado, said the national organization's gatherings in recent years reflect a simple fact: The average age of Vietnam War veterans is rising, with many now in their 70s or even older. "They're getting smaller because we're dying off," he said of the gatherings, adding, though, that there's still a large core group that attends regularly. For many of that era, there's a sense of the inevitable, that POWs don't have much more time to tell their own stories. Some have written books, including McGrath and, more recently, Wideman, a former jet pilot. He's talked about his memoir, "Unexpected Prisoner," in forums across Colorado, including in Greeley and on Shriever Air Force Base. The book recounts his almost six years in captivity, including time at the famed "Hanoi Hilton," where Sen. John McCain, who passed away in August, was also kept. 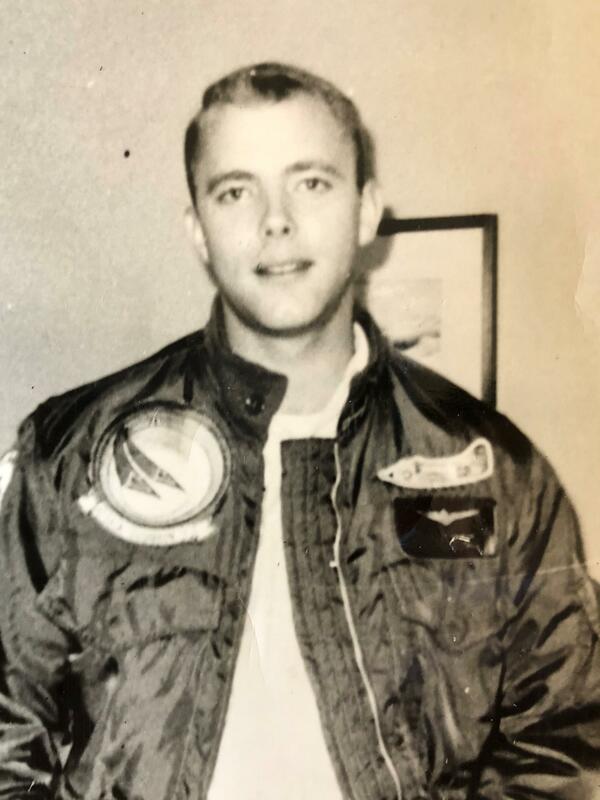 Navy pilot Robert Wideman in the 1960s. Wideman's ordeal began May 6, 1967. On that day, he found himself tumbling through the clear skies over North Vietnam. "I can see between my feet, you know, the blue sky and the ground and the sky and the ground," Wideman said. He'd lost control of his A-4 Skyhawk jet. The control stick jammed and nothing he did could prevent plane from spiraling down. So he launched his ejection seat. "All of a sudden, the parachute just opened up," Wideman said. The wind carried him inland. "I looked out at the coast about two miles away and I thought about my wife and my brother and my family," he said. He wondered if he'd ever see home again as he sent distress signals and called for help on his radio. "I made a couple of transmissions," Wideman said. "You know, 'Raven Lead? This is Two. How do you read?' I got no response. 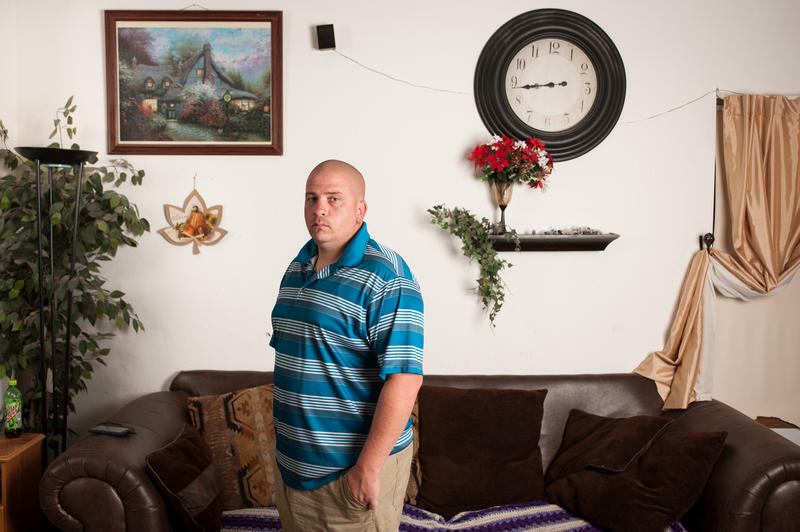 Then about that time I heard the whistling sound of a bullet going by me." When he hit the earth, he had two broken fingers and a dinged up shoulder. He saw a North Vietnamese soldier standing about 25 yards away with a group of villagers behind him. "He's just waiting to see what I'm going to do," Wideman said. "I just turned my palms of my hands up and then he dropped his hands and all these people charged me. They all had knives and they cut me out of everything. They had me down to my underwear in about 30 seconds." Wideman was whisked to a nearby hut and blindfolded. His hands were tied behind his back. He could hear a small battle transpiring outside, the sound of U.S. aircraft attempting to rescue him. Wideman thought there was no chance they'd find him. He wanted his rescuers to go away, to be safe. Soon they did. Then Wideman's captors rushed him from the hut and marched him for what seemed to be several miles through rice paddies and hostile villages. He was put in a truck and, finally, taken to a dark room where an interrogator was waiting. The interrogator says, "What's your name?" He says, "How old are you?" And he says, "What city are you from?" I says, "I can't answer that question." He says, "Well, if you don't answer I'm going to have my guards take you out and shoot you." "Then he asks me again," Wideman said. "I say, 'I'd really like to answer that question, but my government won't allow me to answer that question.'" His captors cinched ropes so tightly around his arms that they felt like barbed wire cutting to the bone. His arms turned purple and he was told that if he didn't talk soon, he was going to lose them. He started to convulse. He shouted that he'd never talk. So they untied the ropes, stand me up. He says, "What city are you from?" He says, "Okay, Row-bert." They liked to call me Row-bert. He says, "Now you can go to sleep." So they hogtied me to a two-by-four and I went to sleep. There were more interrogations in the days and weeks to come. Sometimes the questions seemed friendly, other times important, like what radio frequency Wideman used with his unit. Yet when he tried to lie, his captors already knew the answers and he was punished. "I got a sick feeling in my stomach and he had the guards, this time, put me in manacles behind my back and tied my elbows until they touched; basically your shoulders feel like they're going to pop out of joint," Wideman said. "For some people they did. You can't breathe. You get claustrophobia and on the way out, he takes a little broom and he sticks it in my mouth and says, 'Don't cry' and they walk out the door. And I'm thinking, 'I'm going to lose it.' And then -- they had me figured out -- they came back about 20 minutes later, untied me, put me on a stool, [he] looks at me and says, 'Why did you lie?' I says, 'Because I'm stupid.'" "I did feel terrible," Wideman said, adding, "there's pretty much no way you can resist that stuff." Eventually he was taken to a little windowless room in Hanoi and placed with a few other POWs. "No books," Wideman said. "No games. No nothing." He received two meals a day: rice or a third of a loaf of French bread, bland bamboo or cabbage soup, maybe squash on the side. "It was just boring," Wideman said. "I mean, I counted squares on the ceiling." His fellow prisoners kept him company, but the conversations became circular. Fortunately for Wideman and the others, time was on their side. In early 1968, following the Tet Offensive against the United States, President Lyndon Johnson began to outline a path to peace. "We are reducing -- substantially, reducing -- the present level of hostilities and we are doing so unilaterally and at once," Johnson said in an address. Later that year, around December, Wideman got something that raised his hopes: a package from his family. It was his first contact since his plane had gone down. He got a bar of French-milled soap and photos of his family, including his wife, Patricia, who he said looked gorgeous, and his brother, who'd also been fighting in Vietnam. "I was just so glad he was still alive," Wideman said, adding that he rested easier as a prisoner after knowing his brother was safe. In May of 1969, two prisoners escaped and the prisoners' captors retaliated harshly. McGrath with NAM-POWs said that it "set about a frenzy of torture and brutality." Wideman recalled being hit with a fan belt three times, but said it was nothing compared to what another prisoner received: hundreds of whacks. Ultimately, though, conditions for POWs would improve thanks to the convergence of several factors, such as the lobbying of families back home to bring attention to the plight of prisoners. And, in 1969, Ho Chi Minh, the leader of North Vietnam's government, died. After that, the North Vietnamese "changed their policy and stopped torture," McGrath said. By the middle of 1970, Wideman said he and other POWs were in a vastly different compound in Hanoi. "We had big windows and we're getting out twice a day for two or three hours at a time," Wideman said. "We're getting two baths a day. We're getting packages from home every other month; getting letters we're writing every other month." It felt like they'd be going home soon, yet the POWs spent three more years in captivity. They'd have to wait for the ink to be put to the Paris Peace Accords before they were released. In an address on Jan. 23, 1973, President Richard Nixon said the agreement to end the war would "bring peace with honor in Vietnam." "Within 60 days from this Saturday, all Americans held prisoners of war throughout Indochina will be released," Nixon said. So came March 4, 1973, that day captured on that rescued video that Wideman is watching on his laptop at home for the first time. He peers into the screen, looking at his young self saluting, smiling, thinner, he jokes. Shortly after that, he remembered being on a plane, heading home. "Boy, the plane took off and the wheels came in and I started crying," Wideman said. As his life progressed at home. In 1983, he left the Navy as a lieutenant commander and went into the world of business for a while. Then, he became a lawyer. In the mid-90s, he returned to the world of flight, teaching other pilots as a simulator instructor. Robert Wideman, who was a prisoner of war during the Vietnam War, holds a photo of himself as a Navy pilot and a telegram the military sent to his father after he went missing. Along the way, Wideman divorced, a familiar theme among veterans. Looking back, Wideman said he at times struggled emotionally. After 9/11, he went to a Veterans Affairs clinic and, like more than a quarter of Vietnam-era veterans, was told he suffers from post-traumatic stress. That made him more aware of the triggers, the little things that can set him off, including a tendency to argue with others, he said. Bible study is helpful in that regard, he said, and, since he retired in 2012 and relocated to Fort Collins, so has his family, particularly his six grandkids, who, as luck would have it, all live in the area. On a brisk, early fall evening before sunset, several grandkids gather at Rolland Moore Park to play. One of them -- 8-year-old Max -- comes up for an interview with this reporter and is asked what he knows about his grandfather. "He was in the Civil War?" Max guesses. Max is told his grandfather was in the Vietnam War. A worker with the Department of Veterans Affairs has been arrested in an alleged bribery scheme that federal authorities say targeted a program meant to help disabled veterans, women and other small business owners become successful contractors. Staff Sgt. Eric James, an Army sniper who served two tours in Iraq, paused before he walked into a psychiatrist's office at Fort Carson, Colo. It was April 3, 2014. James clicked record on his smartphone, and then tucked the phone and his car keys inside his cap as he walked through the door to the chair by the therapist's desk.